You have been stymied at every turn, after looking high and looking low, but you can't seem to find a 16GB Google Nexus 4 anywhere. Well, Monday's Daily Steals might make you do a double take. 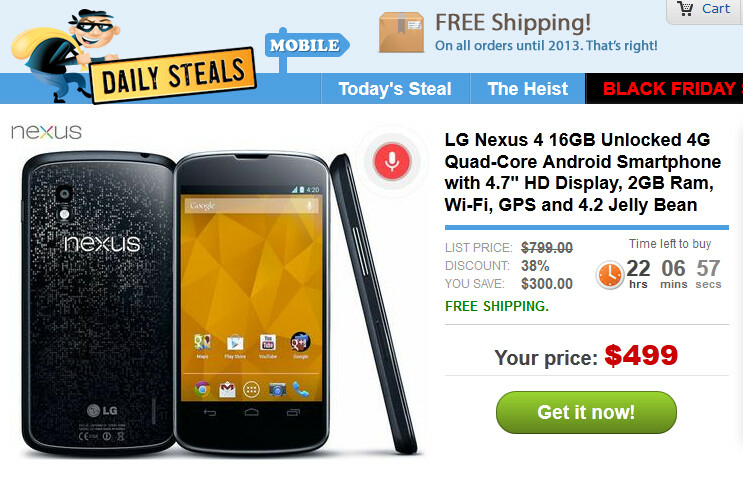 The deal of the day features the 16GB Google Nexus 4 and you have until midnight Monday to take advantage of the deal. 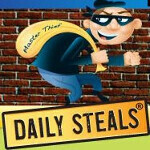 Showing a list price of $799 for the phone, Daily Steals will sell it to you with free shipping for $499. While that is the same price that T-Mobile is offering the unlocked variant of the phone for when it has it in stock, the price is $150 more than the Google Play Store price for the same exact handset. The Google Nexus 4 is a good example of supply and demand. With supply limited, T-Mobile and Daily Steals get to demand $150 more for the phone than Google is asking. Of course, if you don't mind getting locked up for two-years, you could pay the subsidized $199 price (after a $50 mail-in rebate) at T-Mobile once inventory returns. You might be getting tired of waiting for the Google Play Store to once again show the red-hot handset as being in stock. Until then, if you want the model badly enough, you will need to pay up for it. Heck, the $499 beats the $649 price that the phone was going for on eBay. no, they get to ask 150 dollars more. And I get to tell them to screw off. I'd rather go for a S3 for that money.